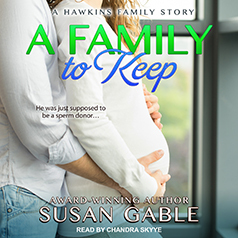 Susan Gable presents book two of the Hawkins Family series. Contains mature themes. He was just supposed to be a sperm donor . . . Desperate to save her daughter's life, Dr. Amelia Young will do whatever it takes, including show up on the doorstep of the sperm donor who made Jordan’s life possible in the first place. Chef Finn Hawkins is taken aback by the woman in his kitchen, asking for a donation of genetic material like a cup of sugar. Anonymously donating as a college student was impulsive. Crazy. But how can he refuse to help save the life of the thirteen-year-old daughter he's never met? Jordan Young has ideas of her own and fate's got plans for all of them. When Jordan runs off to meet her father, Amelia's trip to retrieve her takes an unexpected twist. They're not supposed to be a family. But Finn finds himself longing for exactly that. Can he keep this unexpected family, forged in a desperate attempt to save Jordan’s life? Or will the pressure drive them apart?